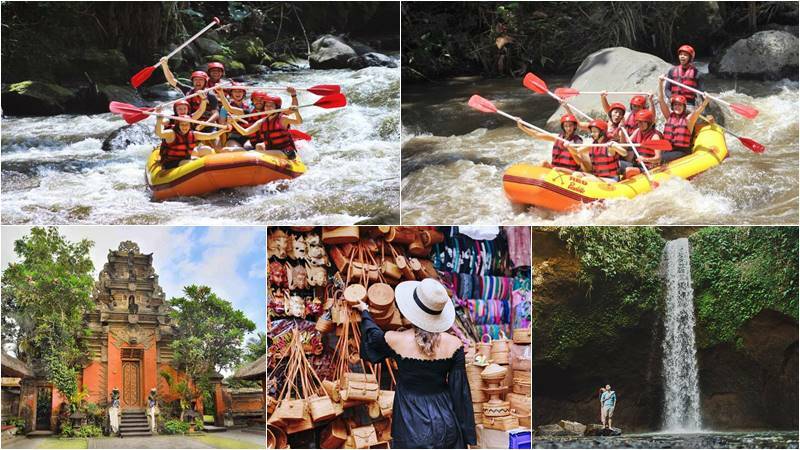 Bali Rafting + Ubud + Tibumana Waterfall tour is one of the most attractive tour package for you to enjoy rafting adventure on the Ayung River, combined with a tour of Ubud to visit Ubud Royal Palace and and Ubud Art Market. Then the tour will continue to discover Tibumana waterfall at Bangli Regency, one of the most popular waterfall in Bali. This could be a truly great journey in Bali island. 16.00 – Visit Tibumana waterfall. 17.30 – Transfer back to hotel. Your adventure of Ubud Ayung river rafting begins with morning pickup by our driver with private air-conditioned car from your Bali hotel and drive through the countryside and arrive at Payangan village, Ubud Bali. After every participant has rafting equipment including lifejacket and helmet, it is time for you to experience a truly unique and memorable epic journey thru winding gorge, luscious jungles, and wild life in its natural homes. Paddle through astonishing waterfalls for unparalleled river fun. Our trained professional guide with internationally accepted equipment will guide you through about 12 km of exciting grades II and III rafting. Your safety is our highest priority always on 2 hours of fun Bali rafting Ubud trip. After your shower and change, the Indonesian Buffet Lunch is served to you while you enjoy views from the stunning restaurant and relax in a peaceful atmosphere of Bali. Buffet Lunch at finish point restaurant after shower and changes. The Ubud Royal Palace is a Ubud Kingdom Palace, and has a beautiful traditional Balinese house as Ubud King’s residence. It is centrally located in Ubud Bali and faces the traditional art market. It was found in the year 1800 – 1823 by Ida Tjakorda Putu Kandel. The palace is a center of artistic cultural life, whilst the traditional market symbolizes the local economy. Puri Saren is equipped as a palace with a Wantilan / auditorium, which is a large building of a meeting room and a banyan tree as shelter place at the daytime. For more than a hundred years, Ubud village has been a “royal town.” Ubud Arts Market is just in front of the Palace to visit. Tibumana Waterfall is becoming popular for tourists lately as the growth of the internet with Facebook and Instagram has increased visitors to this waterfall. In order to reach this waterfall, we must walk about 15 minutes across the stairs and pass the wooden bridge. This is like a deep valley in which the whispers of nature are heard. Just spend your time taking pictures and relaxing. All entrance ticket & donation at scheduled stop.